Made with shallot, parsley, oregano, lemon, capers, red pepper flakes, salt, pepper and olive oil, Italian salsa verde's key ingredient is raw garlic...and lots of it. Originally hailing from the Lombardy region of Italy, this sauce is versatile and can be enjoyed on a variety of proteins including fish and roasted meats. It is often served cold and used as a condiment of sorts or can work as a pesto mixed with pasta. Try it tossed with vegetables as in our Roasted Cauliflower, Wilted Kale, Orzo with Salsa Verde dish. 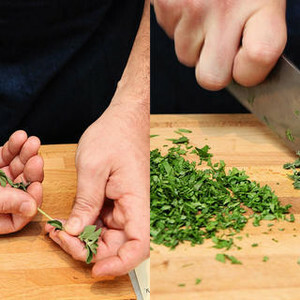 "Gremolata" is a type of Italian salsa verde featuring garlic, lemon zest and parsley and is best known for its pairing with ossobuco alla milanese. While many countries have their own variety of "green sauce" --- the French have "sauce verte" and Germans "Grüne Sosse" --- each is made from very different ingredients, so they are certainly not interchangeable. Let us know what you think about this rich in flavor- though slightly less famous- version of salsa verde...buon appetito!